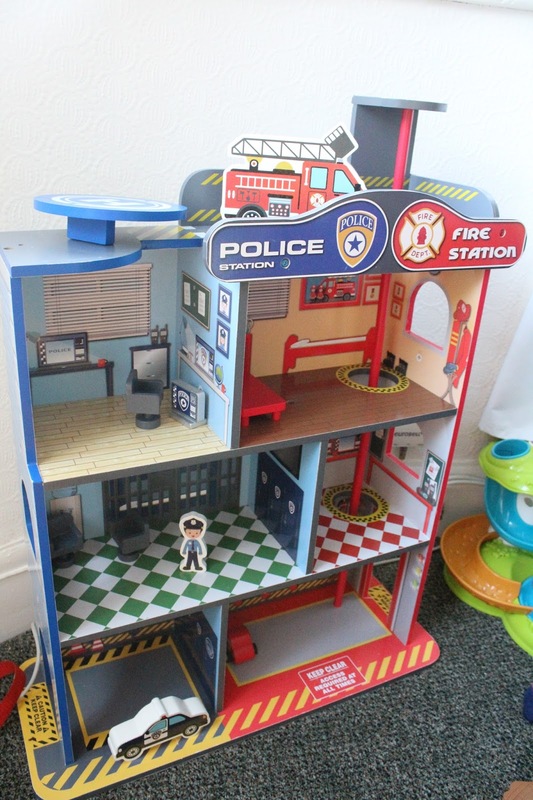 As part of our much-loved role on the Chad Valley Play Panel, we were recently sent the fantastic Wood Shed Fire & Police Station for Tyne to try out. Anyone who knows Tyne knows that he is somewhat obsessed with all things Police related...his favourite books are Cops & Robbers and Burglar Bill, his favourite thing to play with are his toy handcuffs, and he has already requested a Cops & Robbers theme for his 4th birthday in March - so imagine his delight when this parcel arrived and he tore into it to reveal a big wooden police station and fire house! He was beside himself with glee and played with it for hours - infact he still plays with it for hours every single day even a week later and I can't see the attraction fading any time soon! 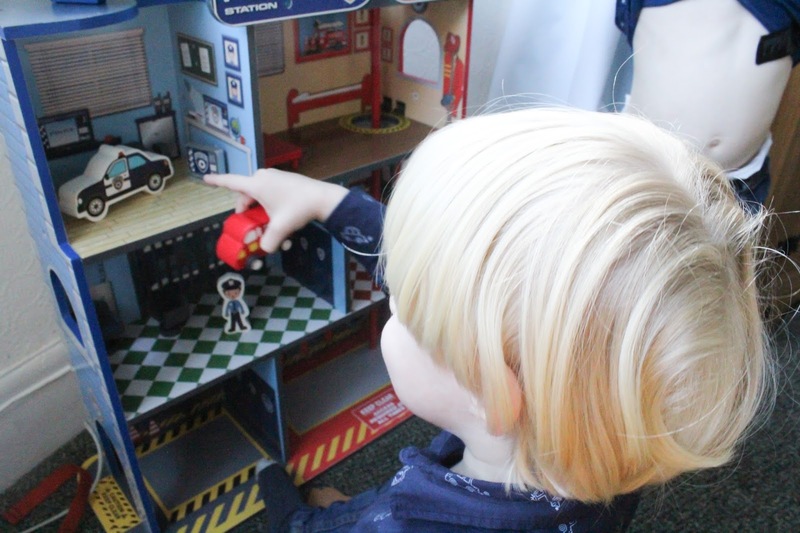 The fire station was super easy to set up and only took a few minutes, it comes complete with accessories such as a wooden police officer, fireman, fire engine, police car, 2 rescue dogs and helicopter as well as a bed and computer desk and chair too. At first Tyne did complain a bit that the cars and helicopter were wooden as he wasn't used to that and was a bit perplexed about not being able to really move the wheels or put the people inside, but he soon got over it and played with them anyway. 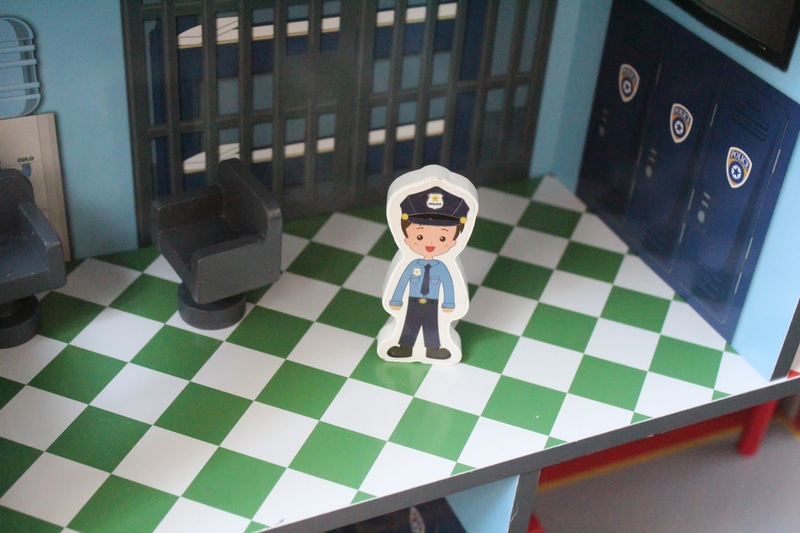 His favourite parts were the helipad on top of the building, and the fire pole that goes from top to bottom level. The wooden building is 4-storeys high with one half set as the police station, and the other as the fire station. The quality is fantastic, and despite being played with on a daily basis by two little boys who can be quite heavy handed I can tell that it will last a long time. 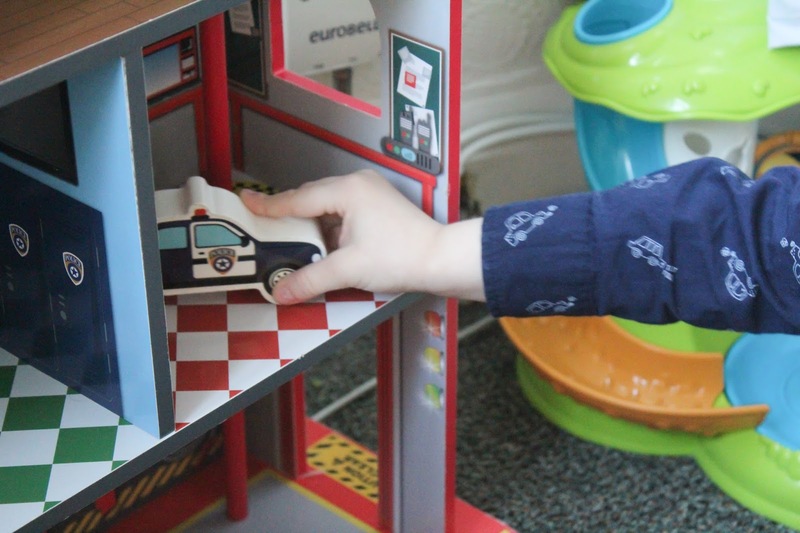 Noah, who is 21 months old, loves to play with the set too and infact its one of the few toys that the boys manage to play with well together as the two sides enable them to each have their own "section" to play with without the need for too many "Thats mine!" squabbles...much to my relief! For the size and quality of the set, and how much entertainment it has given the children I was really surprised to find that it's price is just £29.99 - this is honestly an absolute bargain for what you're getting, and I recommend it very highly. Check back very soon for another generous giveaway from the lovely folks at Chad Valley & Argos!